Click to see a larger version of this infographic. (September 29, 2017) After a successful summer of Better Naito, Portland Bureau of Transportation (PBOT) crews will begin removing the two-way bikeway and pedestrian path this weekend. Come Monday, October 2 Naito’s standard configuration will return, with two northbound vehicular lanes and one standard bike lane. Every year the festivals in Tom McCall Waterfront Park draw hundreds of thousands of people. The Better Naito project was first piloted in 2015 to help manage this influx of visitors, create a safe space for people to travel to these events, and reduce conflicts between people walking and biking and driving along the Waterfront. The success of the volunteer-led effort championed by the non-profit Better Block PDX caught the attention of Portland City Council. After two seasons of volunteer-led effort, Council designated $350,000 to PBOT to implement Better Naito for five seasons. October 2 marks the end of PBOT’s first season spearheading the project. Throughout the summer, PBOT staff worked to improve upon the project and related Naito safety efforts, including installing a permanent new pedestrian crossing at SW Naito and Main and a new bike and right turn signal at NW Naito and Davis. Staff monitored bicycle and pedestrian usage throughout the season, as well as northbound vehicle traffic and travel times. By all markers, the season was a success, serving thousands of people walking and biking with minor travel time impacts to people driving in the northbound lane. Better Naito saw twice the cycling rates of the Waterfront Path, reducing conflicts with pedestrians. During peak afternoon traffic hours 1 in 3 northbound commuters were on bike. Travel times for people driving northbound were consistent with previous summers, with trips taking about one minute longer than without Better Naito. And with the addition of Better Naito, Naito Parkway was not just for people driving or biking - over a thousand people walked in the facility on the average non-event day. During events, usage was even higher. 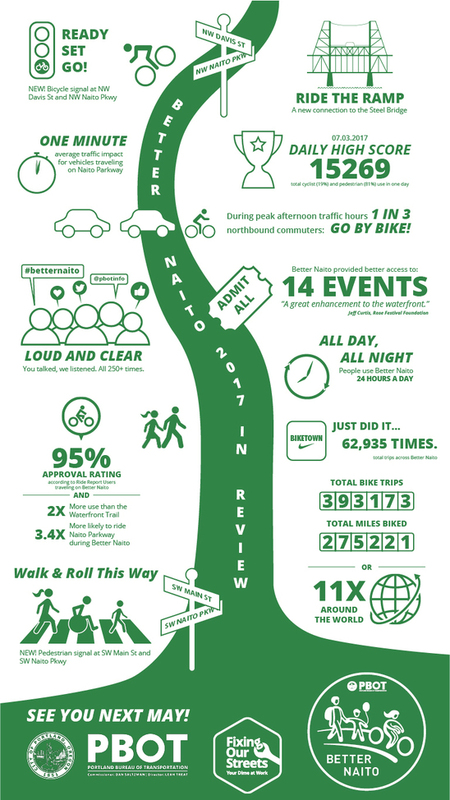 On July 3, during Waterfront Blues Fest, over 15,000 people used Better Naito in a 24-hour period. Check out the attached infographic for more fun facts and data. PBOT will issue a more detailed report on Better Naito later this fall. Anticipate some delays for northbound travel on Naito this weekend as PBOT Maintenance Crews work to remove the white posts to store them for the winter. Learn more about Better Naito at www.betternaito.com.